There is a widely held narrative for climate policy that runs something like this. The costs of damage due to greenhouse gas emissions are not reflected in economic decisions. This needs to be corrected by imposing a price on carbon, using the power of markets to incentivise efficient emissions reduction across diverse sources. Carbon pricing needs to be complemented by measures to address other market failures, such as under-provision of R&D and lack of information. Correcting such market failures can help carbon markets function more efficiently over time. However further interventions, especially attempts by governments to pick winners or impose regulations mandating specific solutions, are likely to waste money. This narrative, even if I have caricatured it a little, grants markets a central role with other policies in a supporting role. Its application is evident, for example, amongst those in Europe who stress and exclusive or central role for the EUETS. While this narrative rightly recognises the important role that markets can play in efficient abatement, it is incomplete to the point that it is likely to be misleading as a guide to policy. A better approach has recently been characterised in a new book by Professor Michael Grubb and co-authors. He divides policy into three pillars which conform to three different domains of economic behaviour. Action to address all three domains is essential if efforts to reduce emissions to the extent necessary to avoid dangerous climate change are to succeed. 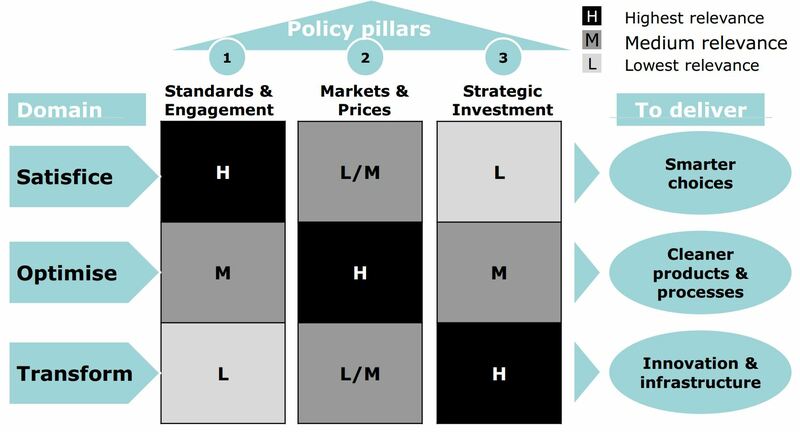 These domains and the corresponding policy pillars are illustrated in the chart below. In the first domain people seek to satisfy their needs, but once this is done they don’t necessarily go further to achieve an optimum. Although such behaviour is often characterised by economists as potentially optimal subject to implicit transaction costs this is not a very useful framework. Much better is to design policy drawing on disciplines such as psychology, the study of social interactions, and behavioural economics. This domain of behaviour relates particularly to individuals’ energy use, and the corresponding policy pillar includes instruments such as energy efficiency standards and information campaigns. The second domain looks optimising behaviour, where companies and individuals will devote significant effort to seeking the best financial outcome. This is the domain where market instruments such as emissions trading have the most power. Policy making here can draw strongly on neoclassical economics. The third domain is system transformation, and requires a more active role from governments and other agencies to drive non-incremental change. The policy pillar addressing this domain of behaviour includes instruments for technology development, the provision of networks, energy market design, and design and enforcement of rules to monitor and govern land use changes such as deforestation. Markets may have a part to play but the role of governments and other bodies is central here. The diversity of policies addressing this domain means that it draws on a wide range of disciplines, including the study of governance, technology and industrial policy, institutional economics and evolutionary economics. As one moves from the first to the third domain there is increasing typical scale of action, from individuals through companies to whole societies, and time horizons typically lengthen. This framework has a number of strengths. It is both simple in outline and immensely rich is its potential detail. Each domain has sound theoretical underpinnings from relevant academic disciplines. It acknowledges the power of markets without giving them an exclusive or predominant role – they become one of three policy pillars. It implies that the vocabulary of market failures becomes unhelpful, as I’ve previously argued. Instead policy is framed as a wide ranging endeavour where the use of markets fits together with a range of other approaches. While this may seem obvious to many, the advocacy of markets as a solution to policy problems has become so pervasive, especially in Anglo-Saxon economies, that this broader approach stands as a very useful corrective to an excessively market-centric approach. The framework is high level, and specific policy guidance needs to draw on more detailed analysis. The authors have managed to write 500 pages of not the largest print without exhausting the subject. However, the essential framework is admirable in its simplicity, compelling in its logic, and helpful even at a high level. For example it suggest that EU policy is right to include energy efficiency, emissions trading and renewables – broadly first, second and third domain policies respectively – as well as to be active in third domain measures such as improving interconnection, rather than relying exclusively on emissions trading (although as the EUETS covers larger emitters, so first domain effects are less relevant for the covered sector). The framework in itself does not tell you what needs to be done. In particular the challenges of the third domain are formidable. But it provides a perspective which deserves to become a standard structure for high level guidance on policy development.